In my work at The Max Foundation, I am reminded every day of the critical role that our physician partners play in saving the lives of thousands of cancer patients worldwide. I am consistently humbled and amazed by the great lengths that these leading hematologists go to in order to ensure that patients receive the best possible care in very resource-poor settings. Some time ago I had the honor of visiting our partner physician in Uzbekistan, Dr. Khamida Kazakbaeva. A committed partner since 2003, Dr. Kazakbaeva manages the treatment of more than 1,200 people living with cancer in the country and accessing treatment through Max Access Solutions. As the only trained hematologist at her hospital, Dr. Kazakbaeva is responsible for monitoring the treatment of every single one of these patients. Despite her extremely high volume of patients, I was struck immediately by Dr. Kazakbaeva’s deep knowledge of each one’s personal story. Often, she knew the patients’ family members as well. During my visit, we were invited into many patient homes to share a meal and get to know one another. Patients and family members referred lovingly to Dr. Kazakbaeva as the “Mother Theresa of Uzbekistan” because of her lifelong dedication to their care and wellbeing. As I soon discovered, her dedication to her patients cannot be overstated. One of the greatest challenges that Dr. Kazakbaeva faces in her work, is reaching patients in remote regions of the country. Uzbekistan is a large country with highly varied terrain, including mountains and expansive deserts. The patients she treats in our programs must visit her every three months to receive a check-up and a re-supply of their treatment. However, traveling this frequently to the capital of Tashkent is impossible for many rural patients who lack the means to undergo such a journey. For example, traveling from the northeastern region of Uzbekistan to Tashkent involves a 2-day trip one way by train and taxi, as well as a hotel stay in Tashkent and then 2-day return. This is both expensive and time-consuming for men and women whose families often depend on them at home. To lessen the burden on these patients, Dr. Kazakbaeva created a biannual fundraiser called “Closer to Patients, Closer to Max.” She uses the money raised to fund her own travel to four strategic areas around the country, setting up a mobile clinic in each where local patients can visit her nearby, rather making the days-long journey to Tashkent. This initiative is extremely time-consuming for Dr. Kazakbaeva, as she must travel regularly throughout the country. When asked about this, she replied that she simply couldn’t imagine not doing everything in her power to ensure all of her patients are able to access treatment. 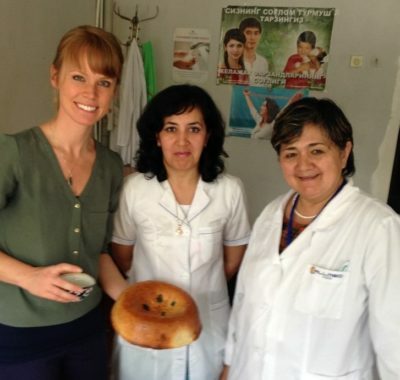 For me, Dr. Kazakbaeva’s willingness to go above and beyond to bring access to treatment to rural patients in Uzbekistan illustrates the crucial role that physician partnerships play in the success of the Max Access Solutions model. Without her dedication and innovative approach to reaching remote patients, hundreds would go without lifesaving treatment. She serves as an inspiration to me personally, and my colleagues around the world who work to bring dignity and hope to all people facing a cancer diagnosis. Erin Lindsay is a Senior Program Manager at The Max Foundation. She is a Seattle native with a background in global public health.